But just in case my recipe is that irresistible, I figured I had better share it with you all. Once you have the eggs hard boiled (here’s how we do it) this really only takes about 25 minutes of your time from start to finish and makes a wonderful appetizer to serve at any type of gathering. As a bonus, it can be a wonderful way to use up any leftover Easter eggs, which I am sure many of us will have. Enjoy! Carefully sprinkle a bit of paprika over the plate, ensuring each egg gets a nice garnish of paprika but not a cloud of it (ask me how that tastes!). Serve immediately or refrigerate until ready to serve. If you do not have dried mustard powder on hand or cannot find it at your store, you may substitute 1 teaspoon of yellow mustard in it’s place. Since the flavor may alter slightly, make sure you taste the mixture and adjust seasonings and and amount of mustard to reach the desired flavor. 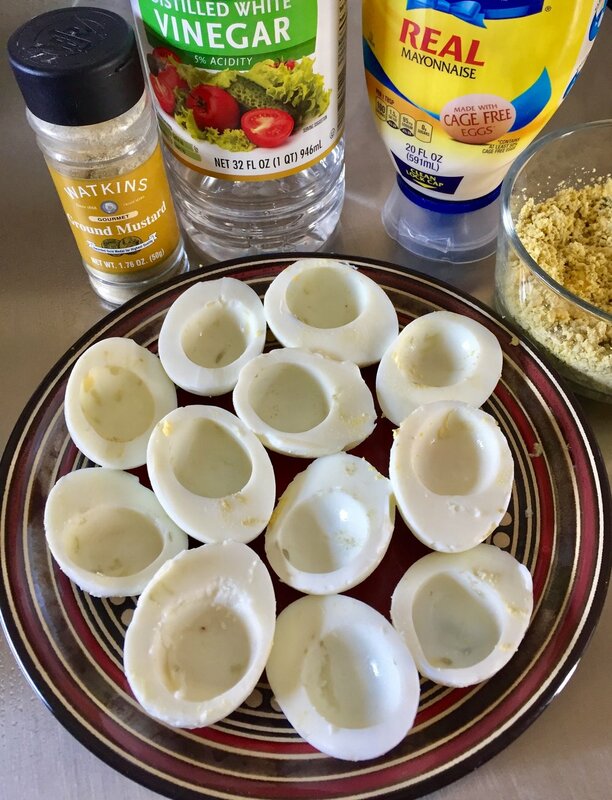 You may peel the eggs up to one day prior to making the deviled eggs but make sure the eggs are stored in a plastic storage container with a good sealing lid. In general, hard boiled eggs give off a “eggy” smell and having them in a quality sealed storage container will minimize this, though not eliminate it from the refrigerator fully. You may want to pop in a fresh box of baking soda after the holidays to help clear out that smell! If you are feeling adventurous, you can always add some extra little touches to the egg mixture. A bit of dill pickle relish, spicy brown mustard instead of regular or even a little cream cheese can give you a fun and unique side dish from the basic and humble Deviled Egg. Just be sure to add a bit at a time and taste, taste, taste!